Combining 1080p HD video quality with the convenience of Analog, Revo Aero is the best value in HD Surveillance. Revo Aero's breakthrough Analog HD technology combines the best of HD with the convenience and reliability of Analog and unbeatable value. Enjoy extended cable range – Revo Aero cameras can work at up to 1000ft of cable, perfect for covering larger buildings. 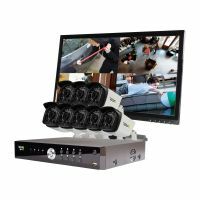 The RA161B8G-2T Revo Aero Surveillance System delivers 1080p HD video quality over BNC Coaxial Cable and is backwards compatible with Analog cameras making it an ideal upgrade for an existing system. The Revo Aero Cameras also come equipped with IR LEDs for HD night-time surveillance. Revo Aero cameras are built for indoor and outdoor use, capable of handling a wide range of temperatures, rain or shine. Securely view your Revo Aero system from virtually anywhere. RevoAero.com website and Revo Aero smartphone app allows you to access your Revo Aero system. View your cameras, adjust settings, and even record video. Take advantage of 1080p HD resolution, with the convenience and simplicity of Analog. Peace of Mind at exceptional value and convenience with Revo Aero. Q:Are the cameras motion activated and automatic recording to safe memory? Does the recording stop after the motion sensor no longer detects movement? Does the recording record over previous when memory capacity is reached? A:1. Yes 2. Yes, the DVR can be set that way. 3. Yes. Q:When purchasing replacement or adding cameras to this AeroHD system, can we purchase any REVO camera or does the camera need to be REVO "Aero" camera? A:The Aero system can work with some of the other cameras we offer but sometimes require an adapter to work with them. Any Aero camera will definitely work with an Aero DVR. Please call us at 866-625-7386 if you have a question on a specific camera being compatible with the Aero DVR. A:Please call us at 866-625-7386 for assistance with this issue. Are the cameras motion activated and automatic recording to safe memory? Does the recording stop after the motion sensor no longer detects movement? Does the recording record over previous when memory capacity is reached? 1. Yes 2. Yes, the DVR can be set that way. 3. Yes. When purchasing replacement or adding cameras to this AeroHD system, can we purchase any REVO camera or does the camera need to be REVO "Aero" camera? The Aero system can work with some of the other cameras we offer but sometimes require an adapter to work with them. Any Aero camera will definitely work with an Aero DVR. Please call us at 866-625-7386 if you have a question on a specific camera being compatible with the Aero DVR. Please call us at 866-625-7386 for assistance with this issue.